7509 Pleasure Ave. (Unit First Floor), Sea Isle City, NJ - Farina & Boeshe Real Estate Co.
~ONE OF THE BEST BEACH LOCATIONS ON THE ISLAND~BATHING & RAFTING BOTH AT 75TH ST. BEACH ~ SURFING AT 74TH Unique design ~ multi-levels with few steps ~ Perfect for those looking to avoid the typical three story townhouse with all the stairs. Spacious, open, light & airy living area with windows all the way around. 9 foot ceilings and OCEAN VIEWS ACROSS 30 FOOT OF GLASS. 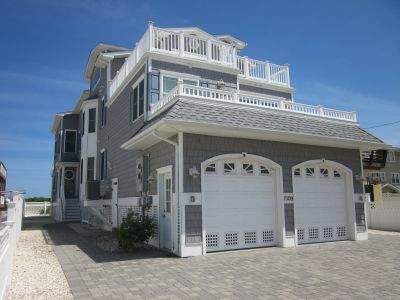 Huge covered oceanfront deck (approx 30 x 18)with outside stereo speakers, gas grill and more than ample deck furnishings plus large private open sun deck off master bedroom suite. Every bedroom has adjoining bath. Features also include Jacuzzi, Hardwood flooring, Granite counters, Upgraded stainless appliances including Wine Refrigerator, 46" TV with DVD & Surround Sound, 4 additional bedroom TVs and Wireless Internet too. Beautifully furnished & decorated.